Talking to your kids about money can sometimes be difficult. Particularly if you grew up in a family where money talk was off limits. According to a 2012 study by T.Rowe Price, 77% of parents admit to not being honest when talking about money with their children and 15% admit to not telling the truth on a weekly basis. Broaching the money subject at a young age is a key to opening up the world of money to your children. Make it fun, teaching your children about pennies, nickels and dimes. 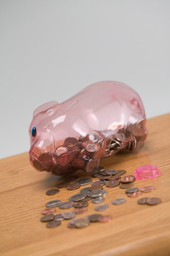 Provide a clear piggy bank so that each child can see the money accumulating. Then take your child shopping and buy something for your child, so that he or she sees that the money in the piggy bank decreases as it’s spent. This reinforces the power of saving money. Research on this subject by Utah State University will shed light on the importance of starting young. Pay your child a small allowance every time the child cleans his or her room or completes a small chore. It doesn’t have to be much, just loose change to start, but be consistent. This will teach the value of work and of earning the money that one spends. Being a role model is perhaps the most important factor when teaching children about money. Showing restraint and budgeting skills by your actions will speak much louder than words for teaching children about money.